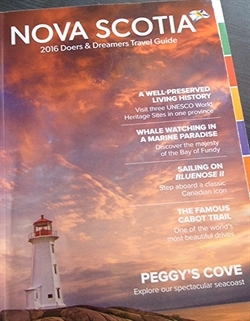 Have you ordered your FREE copy of the 2016 Nova Scotia Doers and Dreamers Guide Book yet? I get one every year. Call 1-800-565-0000 and they will send one. Don't forget to ask for a travel map as well. You can also download FREE copies. Just go to the Nova Scotia Department of Tourism website at NovaScotia.com. I finally got a facebook page up and running for Your Nova Scotia Holiday. Please pop in to 'like' my page and share it with your family and friends! I think it looks great and I hope you 'like' it! I want to be over 1000 likes by the end of the summer so help me out if you can! There is exciting news of a project for a new long distance hiking trail in Northern Cape Breton. It is called the Seawall Trail where they'll be awesome hiking along the coast and cliffs of Northern Cape Breton. The trail will offer 3-5 days of great hiking with huts and tent sites along the way. There is still lots of work to be done. You can donate to the project at Seawall Trail. I came across an article in The Culture Trip that lists the 10 best restaurants in Cape Breton. This is a great resource to have during your vacation. I haven't tried all of them but I can certainly vouch for The Black Spoon, The Lobster Pound, The Red Shoe Pub, Le Gabriel, The Dancing Goat and The Rusty Anchor. I recently had the seafood chowder at the Black Spoon. One of the best that I have ever had. You could literally ceilidh almost every night of the week in Cape Breton! I am serious! Check out my Cape Breton Festivals & Events page and see for yourself! This island is dancing and fiddling all the time. Look at my listing and decide where you want to go to experience a Cape Breton kitchen party. Most of the weekly ceilidhs and square dances are along the Ceilidh Trail but there are others as well including a nightly ceilidh in July and August at St. Michael's Community Hall in Baddeck. I have been wanting to hike the Cape Split trail which overlooks the Bay of Fundy for several summers. Something always seemed to get in the way. Well, I was determined last summer that nothing was going to stop me. Well, nothing did! It was absolutely fantastic! A beautiful sunny day. Cape Split is definitely ones of the best hiking trails in Nova Scotia. Check out my story and pictures on my site. I would love to hear from you if you have done this wonderful trail. I also had the chance to hike the Balancing Rock trail on Long Island. Long Island is part of Digby Neck which is on the southern part of the Bay of Fundy. This is a short trail but one that I would definitely recommend. The trail leads you through lovely woods to the eastern side of Long Island. A set of steep stairs awaits you and will help you make your way downward toward the shores of the Bay of Fundy and the rock formation known as The Balancing Rock. My story and pictures will lead you there! There is only one way to describe Brier Island - mystical!! If you get the chance to go - just go - no questions asked - no excuses - just go! This little place is fantastic. We took a whale-watching excursion with Mariner Cruises and had a fantastic time. We saw a right whale very close to our boat. The right whale is an endangered species which made it even more special. She was the only one we would see but we didn't care.....we were thrilled in her presence. I am very proud to say that I have written my first e-book! 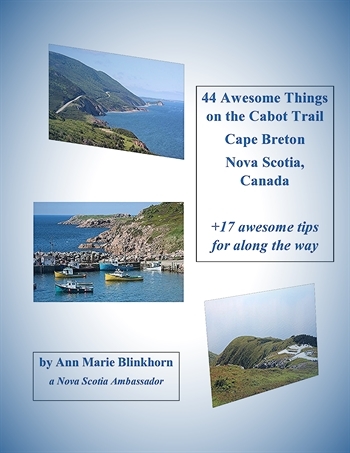 44 Awesome Things on the Cabot Trail is filled with great information about what to see and do during your tour of the Cabot Trail. It also has 17 awesome tips for along the way. This will certainly be a great companion to have during your visit. Did you or someone you know spend some vacation time in Nova Scotia recently? I'd love to hear about it. You can submit your vacation story right on my website. It is very easy! You can add pictures too. Your story will get its very own page on my site! I also want to let you know that I have over 2000 pictures of Nova Scotia on my pinterest pages. Check it out & be sure to follow me! Visit Your-Nova-Scotia-Holiday.com's profile on Pinterest.